​Below are news articles from the latest newsletter (November 2017). If you need the newsletter in its entirety, please contact Newsletter Editor Teri Wilson. DON'T FORGET TO SET YOUR CLOCKS BACK on Sunday, November 5! Indiana. She came to WYSO in 2009 after 30 years as a radio documentary producer for “All Things Considered” at NPR and has won three Peabody Awards, broadcasting’s highest honor, for her work. She is also the author of “If I Live to be 100: Lessons from Centenarians”, which is based on her radio series about people 100 years of age. 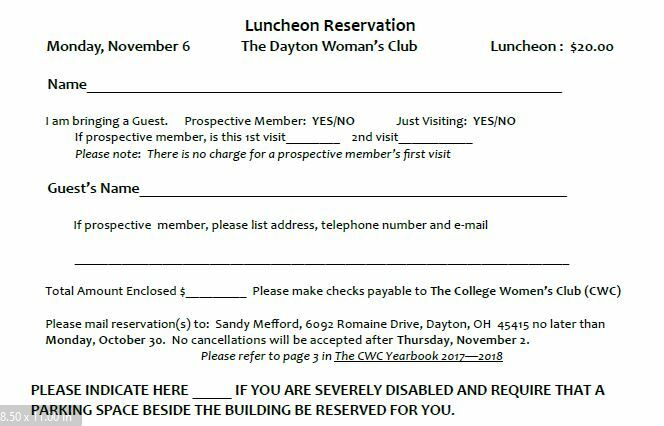 Please remember to make your checks payable to The College Women’s Club (CWC) by Monday, October 30. Tea Cookies by Book Group: Martha Bell, Jean Mahan, Sandy Mefford, Willa Jean Smalley, Marsha Tolle, and by additional bakers: Sue Briesch, Linda Parker, and Brenda Stevenson. At the November Luncheon, Outreach Committee will be collecting money for Children's Cheer or order magazines for Daybreak and The Ronald McDonald house. Volunteer hours will also be collected. Will you spend that time harboring bitterness over things that you are powerless to change? Life doesn’t have a pause button. Life is just life. We have two options in the midst of life’s uncertainties and surprises. We can filter our view of God through our ever changing circum-stances or we can filter our circumstances through broken frameworks which have closed many doors. The universe has its own equation for life, simply expressed “What goes around, comes around”. Why not bring love back to you by giving love. Why not want more for others than you want for yourself and then begin to experience abundance. I am sure that our testimonies of circular experiences can fill any room. One surprising experience is that no pain is wasted. Find your place of peace and be thankful! The Dayton Woman's Club's "hands are tied" concerning the parking lot in the back left of the Dayton Woman's Club as a new company has purchased the lot for employee parking. Parking tokens for the First Baptist Church on the corner adjacent to the new condos are available for purchase for $3.00 from the Dayton's Women's Club - see Heather. I have asked Sandy Mefford to add an item to her reservations form which says "Severely Handicapped" which gives Sandy a heads up as to how many "Orange Parking" cones to ask TDWC to reserve for TDWC parking lot. As an organization we have to work together concerning the parking at TDWC. If you arrive at TDWC early and you are not handicapped please park in the First Baptist Church lot or surrounding lots close to the DWC building as previously recommended. If you ride with someone who has some mobility problems but can walk without assistance please drop them off close to the front door of DWC as I do with my passenger. CWC Board Meeting: The board meeting will be held on November 6 at 10:30 a.m. at the Dayton Woman's Club. December Newsletter Deadline: Tuesday, November 7 to Teri Wilson by either email or snail mail. Teri's contact information is in the yearbook. Cards: Three thinking-of-you cards and one sympathy card were sent out by Marge Lane. Book Group — Leaders: Malou Hurst, Carolyn Nikolai. No meeting in November. Arts and Crafts Group — Leaders: Sandy Mefford, Linda Parker -- Tuesday, Nov. 28 at 11 a.m. Creches at U.D. Roesch Library. Lunch TBA. Gourmet North Group -- Leader: Susan Buckles. Thursday, Nov. 9 at 12:15 p.m. Hostess: Sue Buckles; Co-hostesses: Mary McKinley, Sally Raiteri. Money Management Group --Leader: Marilyn Tolnitch. 21st Century Peace Literacy Foundation" Jerry Leggett, President / CEO. Chairperson: Jean Short. Friday, Nov. 10 at 10:30 a.m.
CWC Scholarships 2017: Jean Short, Chairperson, announced that six applications were received this year. A gift was received that will allow us to provide two scholarships more than the normal two scholarships awarded. Please watch for details on the recipients of the four scholarships in November. December 4. This form is primarily for permission for a picture in which you may appear to be published on our CWC website. If you have questions, please see or call Martha Shields.